We optimize the Client's web site adding keyword loaded alternative text and meta statements, and optimizing the body copy to include appropriate keywords. 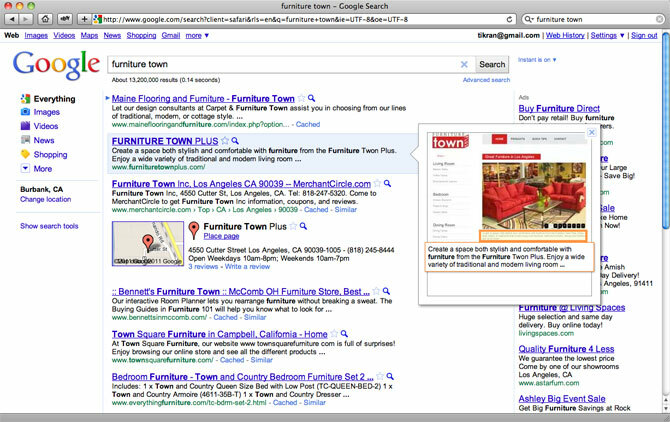 Claim your business listing on Google. It's free! Local customers already search Google for the products and services you offer. By creating a free business listing with Google Places, you can help them find your business more easily. Adding a tag to your Google Places listing allows you to highlight info that you want your customers to see. You can select any combination of locations to target with your campaign, including countries, territories, regions, cities and custom areas. For example, if you want to reach English-speaking users in select locations, you could target specific regions within the United States and a few large English-speaking cities in Europe. Or, if you run a restaurant in New York, you can target your ads to the New York area.